The fifth conference of ministers responsible for spatial planning and development of 11 Baltic Sea Region countries was held under the chairmanship of the German Federal Minister for Transport, Building and Housing in Wismar on 20-21 September 2001. The main focus of the conference was the development of recommendations for future transnational actions based on the experience made since the adoption of VASAB 2010 vision in Tallinn in 1994. The ministers agreed on Spatial Development Action Programme – VASAB 2010 PLUS as a common platform for more focused joint activities. 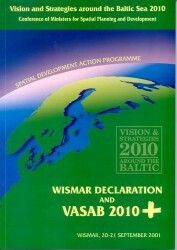 Links and cooperation between VASAB and other spatial development institutions and programmes (e.g. Interreg, ESPON) were defined. The Wismar Declaration stressed the need for spatial planning to promote sustainable development in connection with the enlargement of the EU and marked extension of spatial planning to the offshore areas.